Black History Month is a chance to celebrate the rich cultural contributions that have been made by black people throughout history. It is important that we dedicate time and energy into promoting and recognising the unknown role that black people have made across the UK and the wider world. For over a decade, Black History Month Wales has celebrated Wales’ diversity showcased our heritage, cultural identity and the vast contributions that we have made to our country. Wales has flourishing BAME communities. This year’s celebration includes a list of 100 Outstanding Black Welsh People. This has not only emphasised the great achievements of people within the black community, but also highlighted the variety of projects and causes that will ensure future generations of Black Welsh people will continue to achieve and make alive. My family moved to the UK from Zambia in 1976. I should have grown up in Wales, but my father had a job offer withdrawn when he visited the employer with my mother. My mother is from Zambia and my father from Ogmore-by-Sea, before moving to Griffithstown. I’m fortunate to have an enriched diverse cultural background from two countries that, while very different in nature, are both steeped in arts and culture, surrounded by beautiful landscapes and have a colourful past that is enriched with historical languages. To be able to explore and celebrate these aspects of my heritage along with my peers is a truly wonderful reflection of Wales’ commitment to diversity. As more and more Black History Month events take place across Wales, I cannot help but feel a sense of pride in how far we have come as a nation. I hope that these events continue to inspire the next generation of young black leaders as we still have so much more to change. That’s why I am honoured to have the support of UK BAME Labour. BAME Labour have been at the forefront of campaigning for equality, representation and tolerance within our party. I am delighted and proud to be endorsed by them. The Labour Party has always been instrumental in promoting diversity and championing equality and BAME Labour has led the way within our party on this. 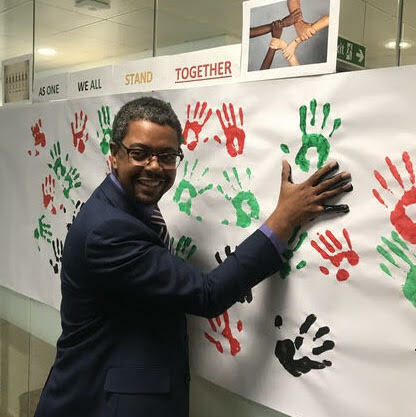 When I look back at my own career so far, as not only the youngest elected President of the Wales TUC but also its first black President, I am honoured to be a part of a wider selection of black leaders who continue to pave the way and break down the barriers for others who will follow. From industry leaders and academics to sports stars and musicians, Wales’ black icons provide us with an example that encourages us all to be the best that we can be. I have been the first on a number of occasions. The first BAME NUS Wales President, the first BAME President of the Wales TUC and after my election as an Assembly Member, the first BAME Minister and the first BAME Cabinet Secretary in Wales or any devolved government. I’m proud of those achievements but there is so much more to do. I’m delighted to be a candidate on the most diverse ballot in the history of Welsh Labour. This should be a watershed moment for us. In Wales, we have a unique opportunity to be the first UK nation to elect a BAME leader. It is absolutely essential that we increase the level of BAME representation in public life. I’m standing on the basis of my ability to lead, as the best candidate for our party and our country. But it is undeniable that my election as Welsh Labour Leader would also offer hope and demonstrate a visible marker of change and progress. For me, Change Takes Courage is more than slogan or a sound bite. For me, Change Takes courage represents the inspirational people that have come before me and our future together as a Nation. Working together with courage, we can be the change that we want for Wales. Vaughan Gething is a Welsh Labour leadership candidate. He is currently the Cabinet Secretary for Health in the Welsh government and the Assembly Member for Cardiff South and Penarth.